This is an little oddity in the pecan pie world of recipes. 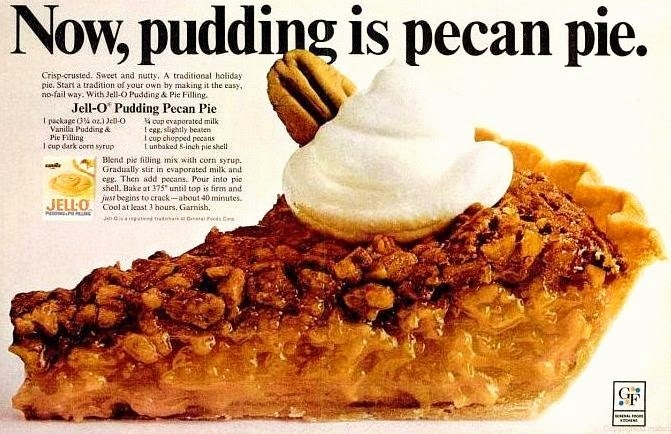 It's filling is based with vanilla pudding. Instead of sugar. But yet still has the corn syrup. Stir together pudding mix with corn syrup. Gradually add milk and egg, stirring to blend. Then add pecans. Pour into pie shell. Bake at 375° until top is firm and just begins to crack, about 40 min. Cool at least 3 hrs. This pie is just a little less sweet than traditional pecan pie. I probably made 6 standard pecan pies, before I figure out how to get it to set up correctly. Because it is all about it getting hot enough... for long enough... to have that stunning wonderful sweet center to get firm. Without over cooking the whole thing. I always use a Marie Callender's Pie Shell. Findable in the Kroger's frozen food section. Come two to a package. The best one I have used. Period. Now I made this version of the pecan pie over the Summer. And it actually turned out perfect with the first attempt. I don't find it as sweet as one made with the sugar and corn syrup. It also cooked in less than 40 minutes too. Instead of an hour, like the traditional recipe. So if you are feeling like making a simpler Pecan Pie, this Thanksgiving... this might be the recipe for you.